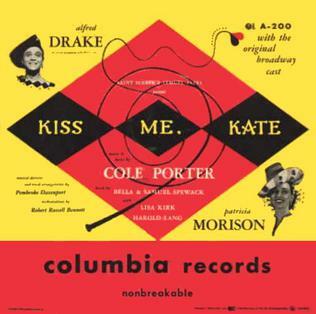 Kiss Me, Kate is a musical written by Samuel and Bella Spewack with music and lyrics by Cole Porter. The story involves the production of a musical version of William Shakespeare's The Taming of the Shrew and the conflict on and off-stage between Fred Graham, the show's director, producer, and star, and his leading lady, his ex-wife Lilli Vanessi. A secondary romance concerns Lois Lane, the actress playing Bianca, and her gambler boyfriend, Bill, who runs afoul of some gangsters. The original production starred Alfred Drake, Patricia Morison, Lisa Kirk and Harold Lang and won the Tony Award. On March 25, 2015, it was announced that the 1949 original cast recording would be inducted into the Library of Congress's National Recording Registry for the album's "cultural, artistic and/or historical significance to American society and the nation's audio legacy". The musical was inspired by the on-stage/off-stage battling of husband-and-wife actors Alfred Lunt and Lynn Fontanne during their 1935 production of Shrew, witnessed by future Broadway producer Arnold Saint-Subber. In 1947 he asked the Spewacks (undergoing their own marital woes at the time) to write the script; Bella Spewack in turn enlisted Cole Porter to write the music and lyrics. After a 3½-week pre-Broadway tryout at the Shubert Theatre in Philadelphia starting December 2, 1948, the original Broadway production opened on December 30, 1948, at the New Century Theatre, where it ran for nineteen months before transferring to the Shubert, for a total run of 1,077 performances. Directed by John C. Wilson with choreography by Hanya Holm, the original cast included Alfred Drake, Patricia Morison, Lisa Kirk, Harold Lang, Charles Wood and Harry Clark. The original West End production opened on March 8, 1951, at the Coliseum Theatre, and ran for 400 performances. Directed by Sam Spewack with choreography again by Holm, this production starred Patricia Morison, Bill Johnson, Adelaide Hall and Julie Wilson. The original Australian production played from February 1952 at His Majesty's Theatre, Melbourne, before seasons in Sydney, Brisbane, Perth and Adelaide until 1954. The production featured Hayes Gordon and Joy Turpin (later replaced by Evie Hayes). A London revival opened in December 1970 at the London Coliseum, in a production by the Sadler's Wells Opera. The cast featured Emile Belcourt (Petruchio), Judith Bruce, Eric Shilling, Ann Howard (Kate), Francis Egerton, Robert Lloyd, with direction by Peter Coe and choreography by Sheila O'Neill. Coe did a translation for British audiences, including having "a tea wagon", and included "traditional English music hall jokes". This revival had a "brief run", according to the Encyclopedia of the Musical Theatre. The Royal Shakespeare Company staged a production at London's Old Vic Theatre, which opened 19 May 1987. Directed by Adrian Noble and staged by Ron Field, the production starred Nichola McAuliffe and Paul Jones as Lilli/Kate and Fred/Petruchio, with Tim Flavin and Fiona Hendley as Bill/Lucentio and Lois/Bianca. The gangsters were played by Emil Wolk and John Bardon. The cast recorded a CD album which is available on First Night Records in their Cast Masters range. A Broadway revival opened at the Martin Beck Theatre on November 18, 1999 and closed on December 30, 2001 after 881 performances and 28 previews. Directed by Michael Blakemore, Produced by Richard Godwin, and choreographed by Kathleen Marshall and Rob Ashford, the opening night cast included Marin Mazzie, Brian Stokes Mitchell, Amy Spanger, Michael Berresse, Ron Holgate, Lee Wilkof and Michael Mulheren. This production won the Tony Awards for Best Revival of a Musical and Best Actor in a Musical for Mitchell; Marin Mazzie received a Tony nomination for Best Actress in a Musical, and Michael Berresse, Lee Wilkof and Michael Mulheren received Tony nominations for Best Featured Actor in a Musical. A West End revival opened at the Victoria Palace Theatre on October 30, 2001, and closed on August 24, 2002. As with the 1999 Broadway revival, Michael Blakemore was the director with choreography by Kathleen Marshall. Brent Barrett and Marin Mazzie co-starred. Chichester Festival Theatre's 2012 revival of the show transferred to the Old Vic Theatre on London's South Bank in November 2012, with an official opening in December. It starred Hannah Waddingham as Lili/Kate and Alex Bourne as Fred Graham. The production was directed by Trevor Nunn. The show received positive reviews from critics and audiences. Hannah Waddingham and Alex Bourne were both nominated for the 2013 Olivier Awards as Best Actress/Actor in a Musical for their performances. In September 2015 Opera North presented a revival directed by Jo Davies, choreographed by Will Tuckett and designed by Colin Richmond. The production opened at the Leeds Grand Theatre before touring to Theatre Royal Newcastle, The Lowry Salford, and Theatre Royal Nottingham. The production was co-produced with the Welsh National Opera where it opened as part of the Shakespeare400 season in September 2016 at the Wales Millennium Centre, Cardiff. The production will then tour to Liverpool Empire Theatre, Bristol Hippodrome, New Theatre Oxford, Mayflower Theatre Southampton, Birmingham Hippodrome, Venue Cymru Llandudno before returning to Cardiff in December 2016. Both productions starred Jeni Bern as Lili/Kate and Quirijn de Lang as Petruchio/Fred. The production is set to transfer to London Coliseum from 20 – 30 June 2018, following a return visit to Leeds Grand Theatre in May 2018. The Roundabout Theatre Company plans to mount the third Broadway revival of Kiss Me, Kate with Kelli O'Hara as Lilli Vanessi and Will Chase as Fred Graham. The production is set to be directed by Scott Ellis and choreographed by Warren Carlyle. Roundabout produced a benefit concert of the show with O'Hara, Ellis and Carlyle in 2016. The revival is set for a limited run at Studio 54. The first preview is scheduled for February 14, 2019, with an opening night on March 14; the limited run is set to end in June. A film version of the same name was released in 1953. There have been at least four television productions, the first on Hallmark Hall of Fame in 1958, with Drake and Morison reprising their Broadway roles, the second recorded for the launch of BBC Two in the UK in 1964, starring Howard Keel, Patricia Morison and Millicent Martin, the third in 1968 with then husband-and-wife team Robert Goulet and Carol Lawrence, and the fourth in 2003 on Great Performances, a high-definition shot performance of the London revival with Brent Barrett and Rachel York.